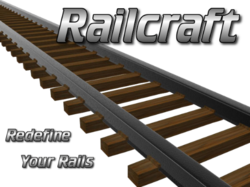 Railcraft is a mod which adds many new kinds of minecarts and tracks, as well as improvements to how minecarts work. It shouldn't be confused with the mod Traincraft. Module based system that lets you remove the parts of the mod you dislike. Extensive configuration file that allows you to disable any block or item or change the way rails are crafted. Rebalanced drag rates for carts - Now your storage carts will actually reach their destination! Completely new collision code - Carts can now push other carts, furnace carts are almost not useless! Names of default minecarts simplified. Minecart reversal recipes. Separate that chest from that cart. All rail recipes completely reworked to make an entire industry out of building a railroad. This page was last modified on 11 July 2018, at 17:08.